The Chinese Shar-Pei (also known as the ‘Chinese Fighting Dog’, and nicknamed the ‘Golden Lion’) lived in the southern provinces of China as far back as 200 B.C, possibly even earlier. ‘Shar-Pei’ means ‘sand skin’, referring to the rough texture of the breed’s coat. The Chinese Shar-Pei likely shares a common ancestor with the Chow Chow, which also originates from China and has a blue-black tongue. Chinese Shar-Peis served as guard dogs, hunters, fighters, workers, and companions for peasants and farmers. Most Chinese dogs were killed after the Communist revolution, but the Shar-Pei was kept alive by breeders in Taiwan and Hong Kong, who brought it to America. Touted as the world’s rarest dog in Time Magazine and The Guinness Book of World Records, the breed became popular and was saved from the brink of extinction. Today, they are a popular pet with over 70,000 representatives of the breed registered. Chinese Shar-Peis have a shoulder height of 48-58 cm (19-23 in) and weigh 18-25 kg (40-55 lbs). They are known for their blue-black tongue and profusely wrinkled head, neck, and shoulders. They have large heads with small, highly set ears, and thick tails which curl over the back. Chinese Shar-Peis have large, wide muzzles, and small, sunken eyes. Puppies have wrinkles all over their bodies. Chinese Shar-Peis come in two coat varieties; both are very hard. The horsecoat variety is short, prickly and bristly, while the brushcoat variety has longer hair. The brushcoat is considered inferior to the horsecoat. There is also a rare bearcoat variety which is double-coated and not recognized by the American Kennel Club. The Chinese Shar-Pei comes in a wide variety of solid or sable colors such as red, cream, blue, and black. The Chinese Shar-Pei is brave, wise, and dominant, but not always obedient. Chinese Shar-Peis are known for being doggedly independent (sorry) and a bit aloof, but are also loyal and loving. They are highly protective of their family and territory. The Chinese Shar-Pei is brave, wise, and dominant, but not always obedient. Chinese Shar-Peis are known for being doggedly independent (sorry) and a bit aloof, but are also loyal and loving. They are highly protective of their family and territory. The Chinese Shar-Pei bonds quickly with its family, and is extremely devoted. Chinese Shar-Peis are not unfriendly toward strangers, but may bark at them when first introduced. They are fine with children and get along with other household pets, provided socialization has taken place at a young age. They sometimes fight with other dogs. You can find Sharpei puppies priced from $300 USD to $2780 USD with one of our credible breeders. Browse through our breeder's listings and find your perfect puppy at the perfect price. The Chinese Shar-Pei bonds quickly with its family, and is extremely devoted. Chinese Shar-Peis are not unfriendly toward strangers, but may bark at them when first introduced. They are fine with children and get along with other household pets, provided socialization has taken place at a young age. They sometimes fight with other dogs. The characteristic folds of skin that cover the Chinese Shar-Pei’s body must be checked and cleaned regularly to prevent irritation. The entire coat should be groomed with a soft brush weekly. Chinese Shar-Peis can live outdoors if given sufficient housing and companionship. Some may have skin problems. They have a life expectancy of 9-11 years. The Chinese Shar-Pei must be trained firmly and consistently. Chinese Shar-Peis can grow bored of repetition, so training should be made diverse and interesting. Chinese Shar-Peis need a considerable amount of outdoor exercise. They should be taken for long walks or allowed to play active games on a daily basis. Chinese Shar-Peis do not like the heat, and should not be over exercised in hot weather. Sharpei Puppies for Sale - Shipped Worldwide! Finding the right Sharpei puppy can be dog gone hard work. PuppyFind® provides a convenient and efficient means of selecting and purchasing the perfect Sharpei puppy (or Sharpei puppies) from the comfort of your home, 24 hours a day, 7 days a week. Take advantage of our PuppySearch or leisurely browse our directory of hundreds of dog breeds, Sharpei dog breeders, Sharpei dogs for adoption, and Sharpei puppy for sale listings with photos and detailed descriptions. Some Sharpei puppies for sale may be shipped Worldwide and include crate and veterinarian checkup. 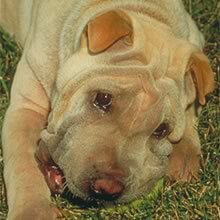 Many Sharpei dog breeders with puppies for sale also offer a health guarantee. With thousands of Sharpei puppies for sale and hundreds of Sharpei dog breeders, you're sure to find the perfect Sharpei puppy.